Join Door No. 3 at their studio on Thursday, December 10th from 5pm – 7pm to celebrate their 7-year anniversary and 2016 calendar launch. Weather, technology, scarcity, and human’s place in nature–these are some of the topics being explored in a new letterpress calendar by artists Laura Gunnip and Robin Doggett of Door No. 3 Print Studio. Last year the duo published a limited edition calendar highlighting nature’s resilience after the Carlton Complex fire. Neither Gunnip nor Doggett expected that they would be faced with a similar experience again just one year later. “After living through two summers of huge local wildfires I think a lot of people are talking about ‘The New Normal’ and what that means.” says Gunnip. “We’re interested in looking at where we are within the scope of history, our time on this planet and facing reality head on.” adds Doggett. 2016, A Wayfinding Calendar for Today’s Climate is a careful curation of early-1900’s imagery that examines the interrelationship of humans and their environment. Gunnip and Doggett hope their calendar sparks conversation that will help each of us navigate our own way through today’s intensifying challenges. 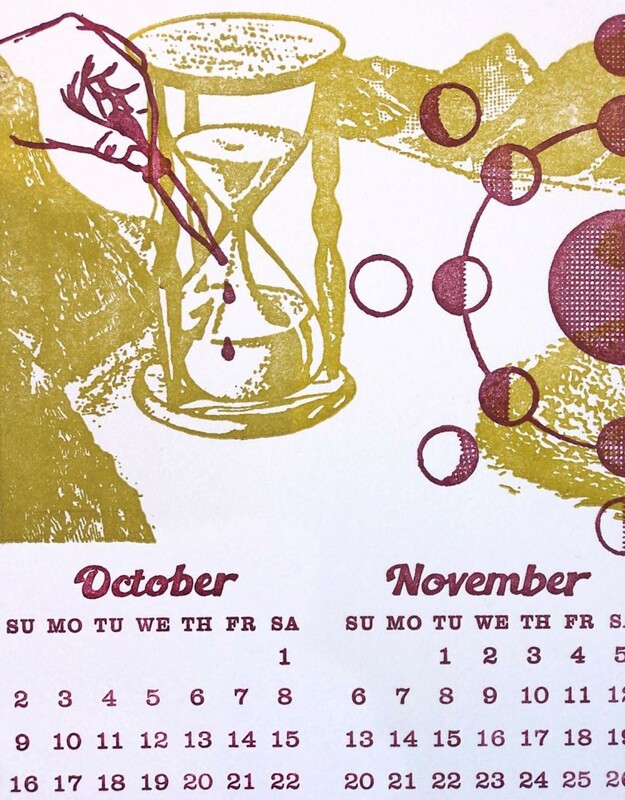 Each calendar is hand printed on our 1911 Chandler & Price Letterpress at our new studio on the TwispWorks campus. This limited edition calendar is available at local retailers or through the Door No. 3 website, www.doorno3.com. DATE: Thursday, December 10, 4-7pm LOCATION: Door No. 3 Studio at TwispWorks Campus CONTACT: 509.449.1081, info@doorno3.com.